Advanced mobile devices and app software have opened up new avenues for retailers. 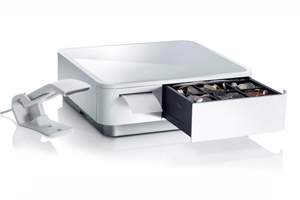 At Star Micronics we’ve developed the world’s first conceptually driven, combined point of purchase cash drawer and printer in response to the need for an easily integrated mobile POS system. In the mPOP we’ve created something that’s aesthetically simple and elegant, yet loaded with intuitive design features. At just 10cm high and 30cm wide it’s easily transportable, whilst the Bluetooth connectivity means only one mains cable is needed for full operation. mPOP works with all major mobile operating systems including Apple iOS, Android and Windows, giving retailers the freedom to use the platform that works for them. The multiple functions and connectivity of the mPOP make processing customer transactions smooth and effortless for outlets such as bars and cafés, florists and pop up shops. The sleek design will complement any counter top or, for an even less intrusive look, it can be secured underneath a countertop.